From the leading manufacturers of LED grow lights, the BESTVA DC series 2000w is great for all cultivators. Providing 2000 watt at decent price, this energy efficient light gives you great coverage. The eight years of experience from BESTVA and the popularity on Amazon speak for itself. 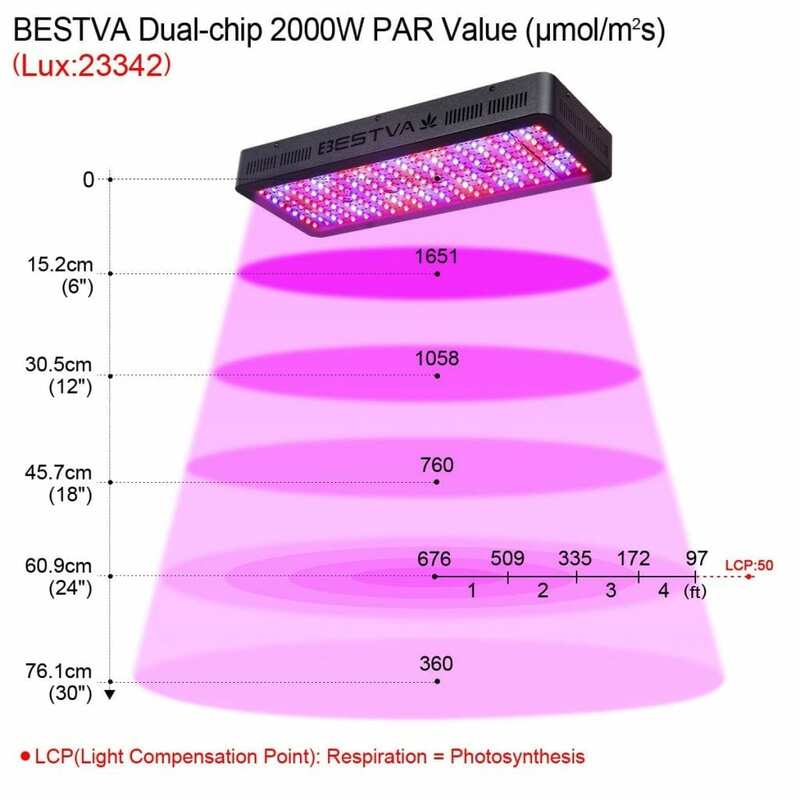 Looking for other sizes of this BESTVA LED grow light? We also reviewed the BESTVA DC Series 1000w. 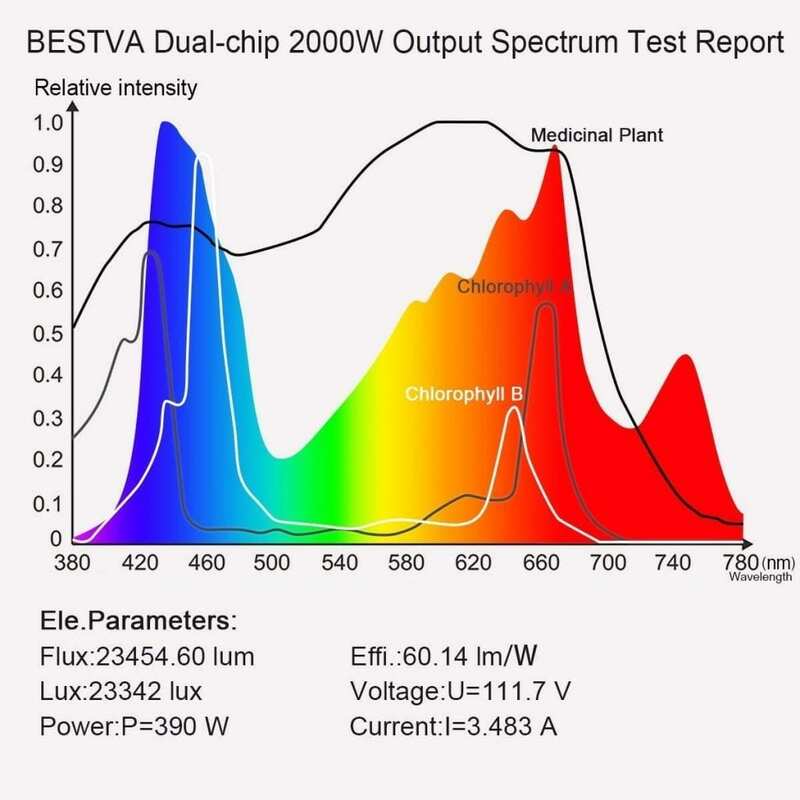 Bestva 2000w DC series LED grow light has especially attractive features for beginning growers. This light has everything a beginner indoor grower needs. 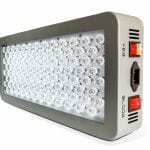 Bestva 2000w LED grow light comes with a collection of 200 LEDs of 10 watts each. This collection gives a full-colour spectrum along with an intense light. For the sustainability of plant growth, it has UV and IR spectrum. Furthermore, the colour bands range from 380nm-780nm. These are exactly the wavelengths you need for your plant to give great yields. The good ratio of the spectrums makes it an advanced light and improves the process of photosynthesis. On the other hand, the dual chip technology is there to give a brighter light every time. Coverage area is one of the essential factors of a LED grow light. It helps the light in reaching as many plants as possible. If you know the coverage, you know how many cannabis plants you can grow with a certain amount of lights. 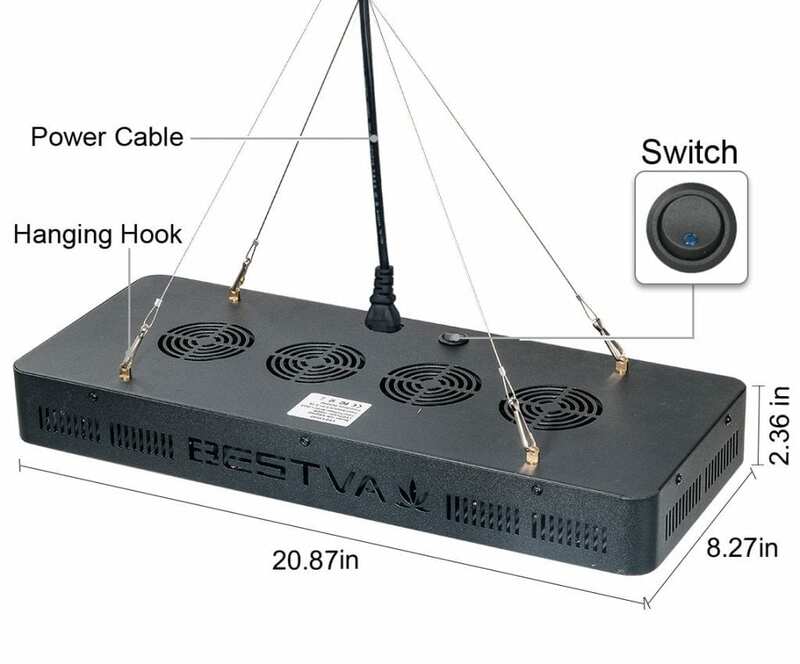 Bestva DC 2000w LED grow light’s coverage area is about 7×6.5 feet. This is quite a lot for a light of this price. Thus, it provides a good spread and reaches multiple plants with one light. The Bestva 2000w LED light comes with good PAR values and energy efficiency. Consequently, this 2000w LED grow light replaces a 1400 watt HPS/MH while consuming only 390 watts. This makes it an extremely energy efficient choice for you. It is able to deliver 760 umol, which you can check with your PAR light meter. The BESTVA DC Series 2000w has multiple cooling fans implemented. The aluminium sink keeps the temperature at an ideal level. It dissipates the heat and prevents your plant and the environment. This way, you can balance your environment. Bestva DC series LED grow light has a warranty of 3 years. There is also 30 days refund policy to give you complete customer satisfaction. A bit short if you ask me, because you can’t test the reaction of your plants to these lights in 30 days. Do you want to see how this light looks right out of the box? Check out this unboxing video. 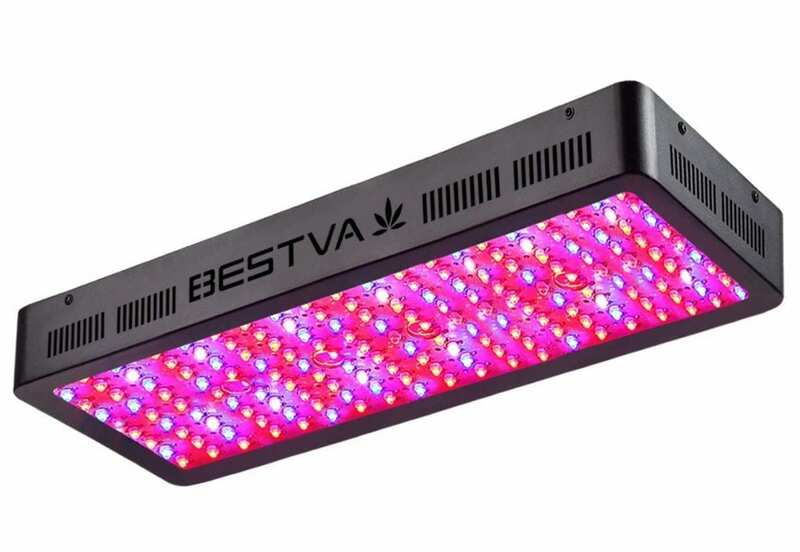 This BESTVA 2000w LED grow light is ideal for beginners. Especially in the flowering stage, this light provides the perfect spectrum. 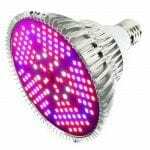 It is a reliable and safe option for every indoor growing enthusiast and its popularity is well-known in the LED grow light market. Check out amazon if you don’t believe that this light is very popular. The amount of reviews is tremendous and overwhelmingly positive. This light is definitively one that we recommend. 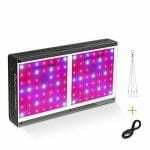 If you’re looking for a basic and cheap 2000w LED grow light, this is your best option. 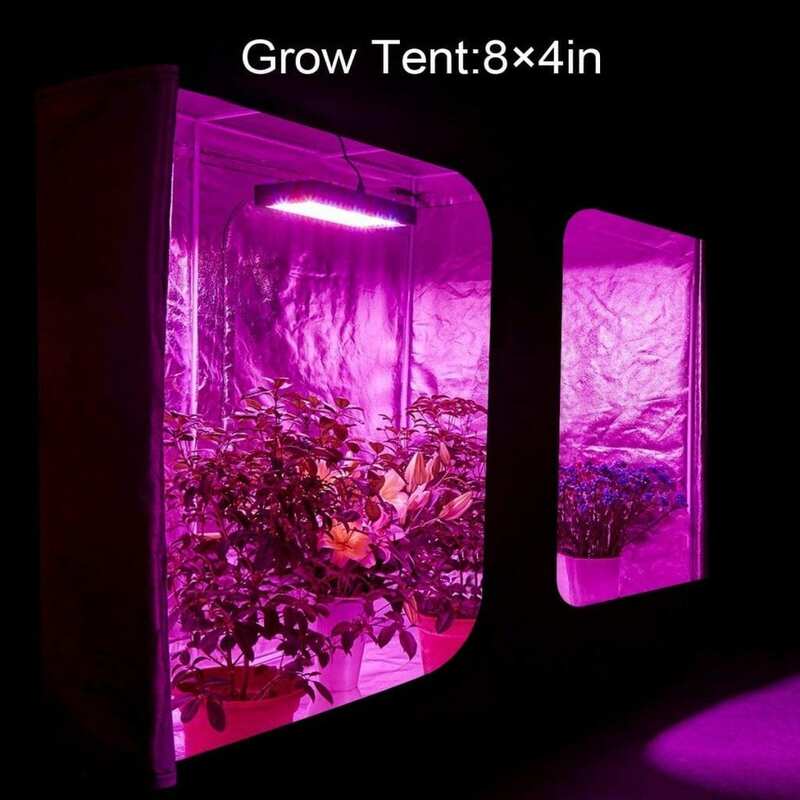 Looking for the perfect grow tent for this LED grow light? Check out our best 4×8 grow tent reviews article. Is this light too big for you? We also wrote about the best 600w LED grow lights and the best COB LED grow lights.